PY165 Motor Grader The Choice for Performance & Value. 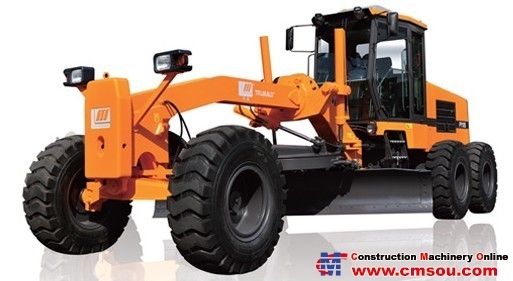 Extensively used in road construction, drainage works, snow plowing or any site requiring precision grading, the PY165/PY185 motor grader with its high traction power is fully equipped for safe, comfortable, easy, high efficiency and reliable operation. gives operators a responsive motor grader that is maneuverable with a tight turning radius. • Uses axles customized for motor graders, ensuring reliable power output and safety. • Articulated joint combined with wheel lean steering ensuring low turning radius and excellent maneuverability. • Electronically controlled hydraulic automatic transmission with 6 forward and 3 reverse gears provides reliable and flexible operation. • Tandem rear drive axles with NO-SPIN automatic differential lock. • Reliable internationally recognized brand hydraulic component ensures reliability. • Technologically advanced international brand brake system used. • Adjustable control panel, seat, operation lever positions and good console layout for ease of operation. • Large number of optional installations available; front blade, rear mounted scarifier, automatic leveling installation etc.